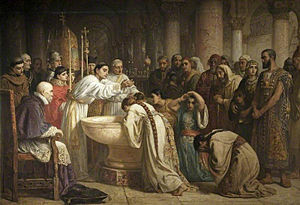 The Moorish Proselytes of Archbishop Ximenes, Granada, 1500 lukisan Edwin Long (1829–1891), manggambaran pambaptisan sajumlah umat Islam di Spanyol. Pamasoan agamo Katolik ka umat Islam di Spanyol dilaksanoan malalui sajumlah larangan baragamo Islam nan diterapkan di karajoan-karajoan nagari Spanyol di awal abad ka-16: Wilayah Takhta Kastilia di tahun 1500–1502, lalu Karajoan Navarra di tahun, dan Wilayah Takhta Aragon di tahun 1523–1526. ↑ Harvey 2005, hlm. 14. Carr, Matthew (2009). Blood and Faith: The Purging of Muslim Spain. New York: New Press. ISBN 978-1-59558-361-1. https://books.google.com/books?id=netlOtzI6R8C. Catlos, Brian A. (2014-03-20). Muslims of Medieval Latin Christendom, c.1050–1614. Cambridge University Press. ISBN 978-0-521-88939-1. https://books.google.com/books?id=PtXSAgAAQBAJ. Coleman, David (2003). Creating Christian Granada: Society and Religious Culture in an Old-World Frontier City, 1492–1600. Ithaca, New York: Cornell University Press. ISBN 0-8014-4111-0. https://books.google.com/books?id=PFHCqgOVi5cC. Dadson, Trevor. The Times Literary Supplement. http://www.the-tls.co.uk/articles/private/moors-of-la-mancha/. Harvey, L. P. (1992). Islamic Spain, 1250 to 1500. Chicago: University of Chicago Press. ISBN 978-0-226-31962-9. https://books.google.com/books?id=td3tcLWvSNkC. Harvey, L. P. (16 May 2005). Muslims in Spain, 1500 to 1614. Chicago: University of Chicago Press. ISBN 978-0-226-31963-6. https://books.google.com/books?id=7QJygx-jbKcC. Harvey, L. P.. The Times Literary Supplement. http://www.the-tls.co.uk/articles/private/fatwas-in-early-modern-spain/. Hendrickson, Jocelyn N (2009). "The Islamic Obligation to Emigrate: Al-Wansharīsī's Asnā al-matājir Reconsidered" (Ph.D.). Emory University. https://etd.library.emory.edu/view/record/pid/emory:53vmf. Diakses pado 1 Pebruari 2016. Lea, Henry Charles (1901). The Moriscos of Spain: Their Conversion and Expulsion. Philadelphia: Lea Brothers & Company. https://books.google.com/books?id=wvFWAAAAMAAJ. Rosa-Rodríguez, María (2010). "Simulation and Dissimulation: Religious Hybridity in a Morisco Fatwa". Medieval Encounters (Leiden, The Netherlands: Brill) 16 (2): 143–180. doi:10.1163/138078510X12535199002758. ISSN 1380-7854. Stewart, Devin (2007). "The Identity of "the Muftī of Oran", Abū l-'Abbās Aḥmad b. Abī Jum'ah al-Maghrāwī al-Wahrānī". Al-Qanṭara (Madrid, Spain) 27 (2): 265–301. doi:10.3989/alqantara.2006.v27.i2.2. ISSN 1988-2955.